West Mercia Police says it received reports of of a man "pointing a gun at another motorist" near Junction 8 of the M5 an hour before a fatal incident near Portishead. At 8.30am yesterday (Wednesday 27 September) we received a report of a man in a vehicle pointing a gun at another motorist near to junction 8 of the M5. The incident was passed on to the Central Motorway Policing Group (CMPG). The IPCC has been informed of this incident. Avon and Somerset's Police and Crime Commissioner and Chief Constable say their thoughts are with the man who died in yesterday's incident on the A369 near Portishead. In a joint statement, they confirmed the incident is still being investigated. The Portbury Hundred remains closed to traffic. Police have also thanked local people for their patience regarding disruption to traffic. Our thoughts are with the family of the man who died and all those involved and affected by yesterday’s incident. A full investigation by the Independent Police Complaints Commission (IPCC) is underway, and we are working to support this ongoing investigation. At the request of the IPCC, The Portbury Hundred (A369) is still closed as they continue their detailed search of the scene to ensure they capture all of the evidence. They are very much aware of the disruption their continuing road closure is having on people who live and work in Portishead. We fully understand just how disruptive this has been for our local communities and their frustration at the amount of time the closure has been in place. Our own Police and Fire staff at Headquarters in Portishead have been similarly affected by the congestion. The IPCC investigation at the scene must run its course, but at the same time we have impressed upon them the need to open the road as soon as it is possible to do so. We are very grateful to local people for their patience and understanding and fully appreciate the tremendous inconvenience that this has caused. As soon as there is any news about re-opening the road we will share this with you. Police have released an update on this morning's incident in which a man died. Earlier this morning we received calls from concerned members of the public travelling on the M5 who reported they had seen a man in a car with a handgun. The vehicle left the motorway at junction 19 and officers stopped the car on the A369 known as the Portbury Hundred. Shots were subsequently fired in an incident involving police firearms and a man has died. Police say they referred the incident to the Independent Police Complaints Commission and they are now on the scene carrying out an independent investigation. The road is still expected to remain closed for some time. North Somerset Council has released advice for people trying to get to Portishead following this morning's incident in which a man died. The Portbury Hundred (A369) at Portishead is likely to be closed for the next few hours following a police incident. The road is closed in both directions from Junction 19 to its junction with Conference Avenue, including Sheepway and Station Road in Portbury. The surrounding area is very congested, so best to avoid it if at all possible. Caswell Lane is closed at the junction with Naish Hill in Clapton-in-Gordano and Nortons Wood lane, junction Walton road (B3124) is also closed. If you are heading home to Portishead tonight either northbound or southbound on the M5 then your best route home is via Clevedon Junction 20 and using the B3124 towards Portishead. Your patience with fellow motorists tonight would be greatly appreciated. Portishead say the Portbury Hundred (A369) from J19 of the M5 to Portishead will remain closed "for a number of hours" following an incident this morning in which a man died. Avon and Somerset Constabulary say diversions are in place and they are asking motorists to use alternative routes. We thank anyone affected for their patience and understanding. The Independent Police Complaints Commission has confirmed it is investigating the scene of an incident this morning involving police firearms in which a man died. The Portbury Hundred (A369) remains closed to traffic. Earlier the Great Western Air Ambulance said its helicopter has left the scene. Thirty five teams signed up to the event on Sunday July 16. Each team raced along a 400 metre track down the town's Esplanade. Several ducklings have been rescued after hatching at an open air pool in Portishead. 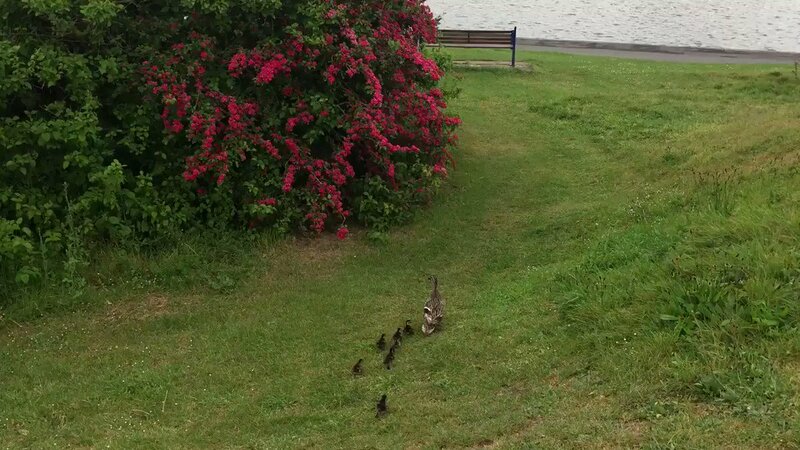 Staff at the Portishead Lido posted this video showing the ducklings following their mother to a nearby lake after they hatched over the weekend. Gordano School - Portishead - won the U13s national championships this weekend. They took on Thomas Telford School from Shrewsbury in a showpiece Wembley final on Sunday, before the Football League Trophy final. The all conquering girls have swept aside 15 other teams on the way, becoming regional and then Southern England champions.